My sweeties, today, I want to talk about my current beauty favourites again and this time, the topic will be “travel essentials”. While travelling, I often don’t feel like taking along very many beauty-products (mainly, because I’m afraid that all the glass bottles might break), and thus, I tend to only pack the basics. But really good basics, you know?! For our trip to Bali, I knew for example, that I wouldn’t be wearing a lot of make-up. The humid heat would have washed it all away within minutes, anyway. On the other hand, refreshment and detox for me skin was very important to me and so was a good shower product and scent. So I’ve photographed them all for you and written a little something to each of the products and also put a link down for you to shop – as usual. 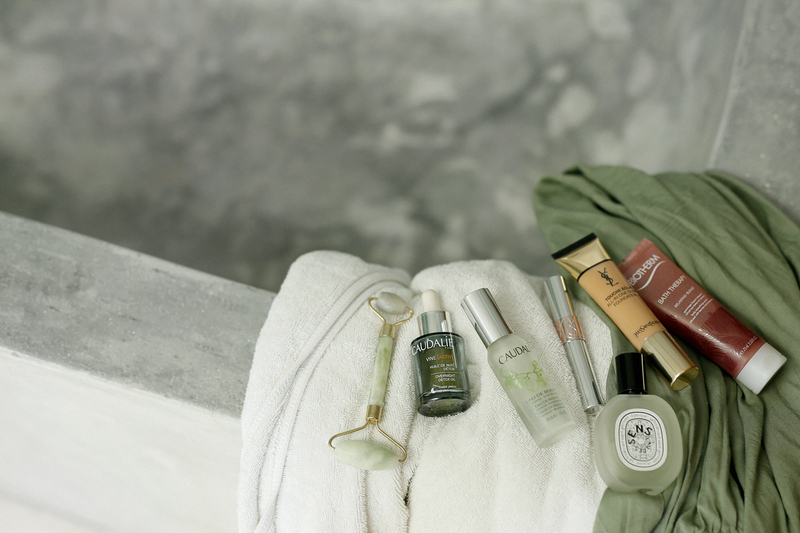 What are your beauty-faves when it comes to travel? Do you have an ultimate must-have?? Do let me know in the comments! For daytime, my favourite freshen-up product everrr is Eau de Beauté* by Caudalíe. 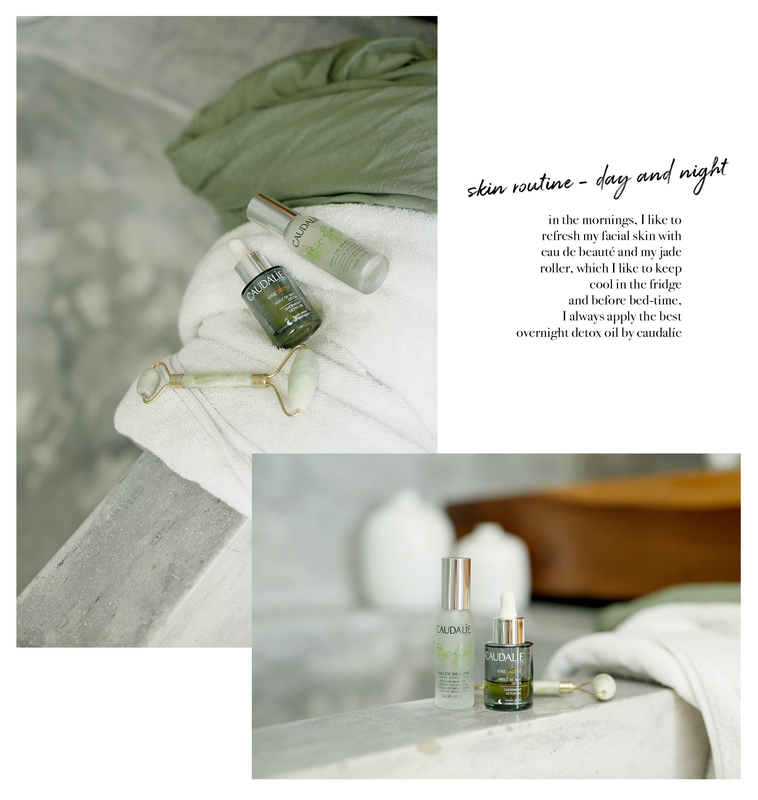 In the evenings, I always use Vine[Activ] detox night oil* and I’m a true believer of this oil. It regenerates my skin perfectly and I couldn’t think of a better option. So these two always go on travels with me. Furthermore, I like to roll a cool jade roller over my swollen eyes in the mornings. It’s the perfect way to remove the swelling and make me feel fresh and awake. During these holidays, I didn’t take an eau de parfum with me – with all the humidity, swimming and heat, it wouldn’t hold long, anyway. 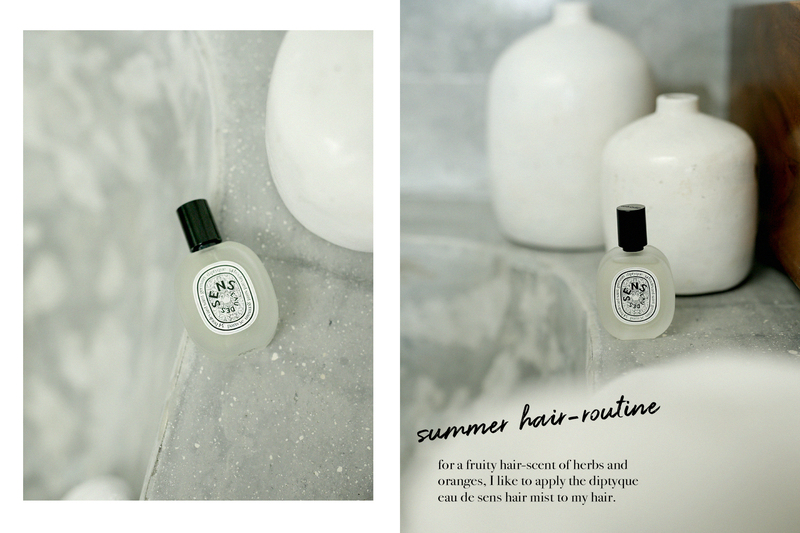 Instead, I took along the Eau de Sens hair-mist by diptyque*! This zesty and herbal scent is perfect to freshen up my hair during daytime. I really love it. 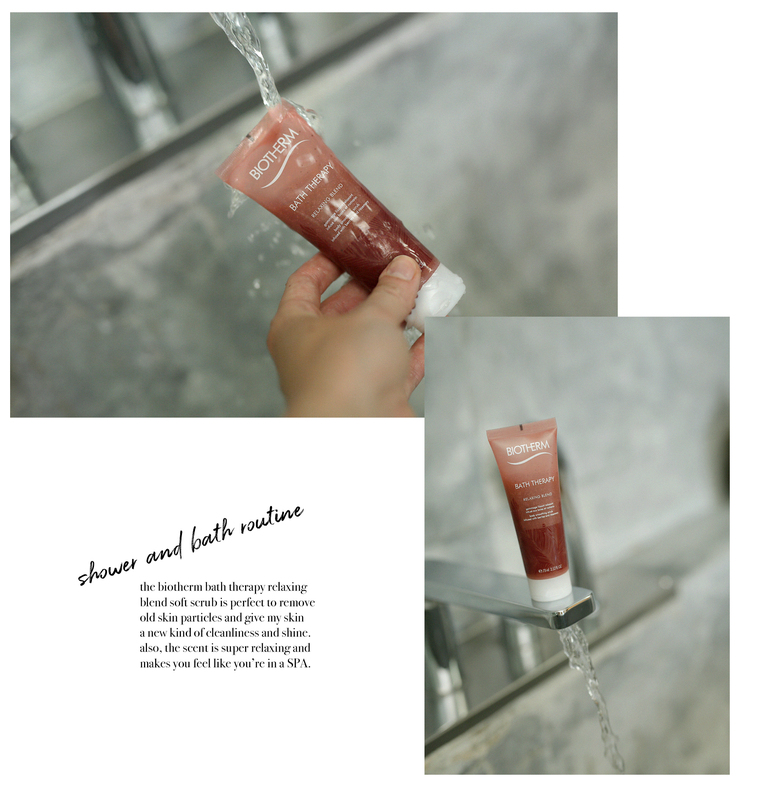 With Goji-berries and rosemary, the Biotherm Relaxing Blend scrub* is perfect for a relaxing shower and a shiny, fresh skin. It almost feels like a SPA-day at home, it smells and feels THAT good! The only make-up I took along to bali were a good and especially light foundation and a lip tint. I knew that everything else wouldn’t hold for long anyway, so I didn’t even take it. 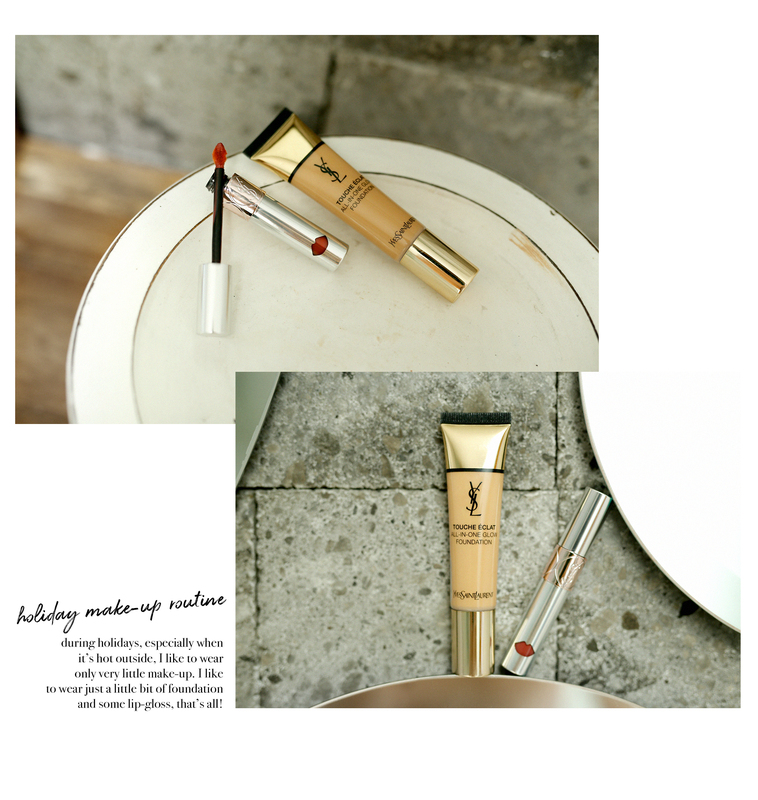 But for my two make-up products, I trusted in my beloved YSL Beauty: I took along the Touche Éclat All-In-One Glow Foundation* and the Volupté Liquid Lip-Balm*. Just add an idea of mascara and you can imagine how minimal my make-up in Bali looked like! I hope you enjoyed this month’s beauty favourites and I hope you found something to your liking, too! If so, do let me know, I really appreciate your feedback! hach ich liebe es ja, die Beauty-Routine von anderen anzuschauen! so einen Roller z.B. habe ich noch nie benutzt, stelle mir das aber für die Durchblutung echt super vor! Caudalie is my favorite brand and I will try the detox night oil further to your recommandation! Thank you for sharing!